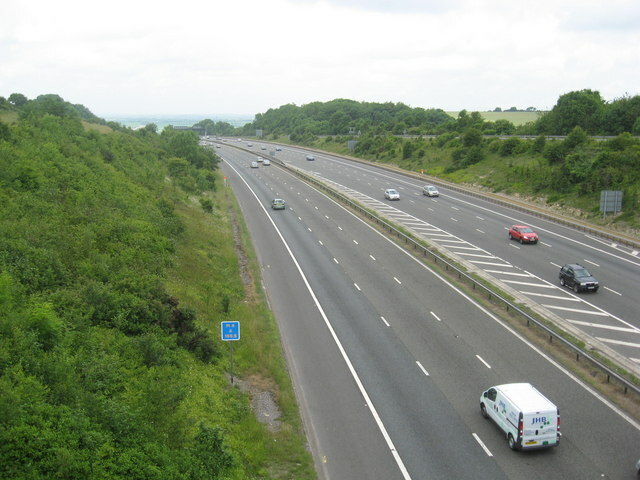 The M4 is a constant looming presence on the Cotswold Way. Walking from the north, you start off 80 miles or so away from it, but you always know that it’s there in-between you and Bath. At some point it has to be crossed. © Copyright Dr Duncan Pepper and licensed for reuse under this Creative Commons Licence. Alice’s blisters have (just about) healed enough for her to start again on her Cotswold Way Challenge and I joined her again this week for another section, as she approached the motorway. You first hear it as you reach the churchyard at Old Sodbury. It’s still three or four miles away, but the elevated position of the church, which gives it a great view, seems to help the sound to travel there. After that you’re into more of a dip as you cross Dodington Park and the sound fades away, but not for long. The trail crosses the A46 and heads east to Tormarton to avoid the motorway junction and find a quieter bridge over the M4. There’s still an uncomfortable section walking along quite a busy road that has no pavement either side, before the path turns and heads back west. For almost two miles you’re walking roughly parallel to the motorway and only a short distance away from it, with the constant roar of traffic from both the M4 and the A46. It must be about the least attractive bit of the Cotswold Way (although the dreadful fly-tipping mess of the old quarries above Cheltenham probably pips it). So I hereby launch the campaign for a new pedestrian footbridge over the M4. I’d suggest a position just west of the A46, roughly by Springs Farm, where the motorway is still in a cutting, before falling away down what remains of the Cotswold escarpment at this point. 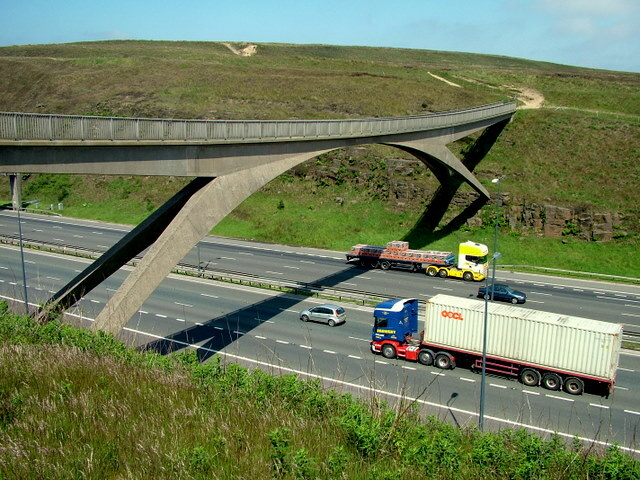 It could be a very striking position for a bridge, and brings to mind the elegant pedestrian bridge that carries the Pennine Way over the M62. I hear that a new garden footbridge is planned for the Thames in London that is likely to cost 170 million pounds. A bridge over the M4 for the Cotswold Way might not be as high profile as that, but it could surely be built from the small change left over. Meanwhile Alice keeps heading on southwards. Almost Bath time. 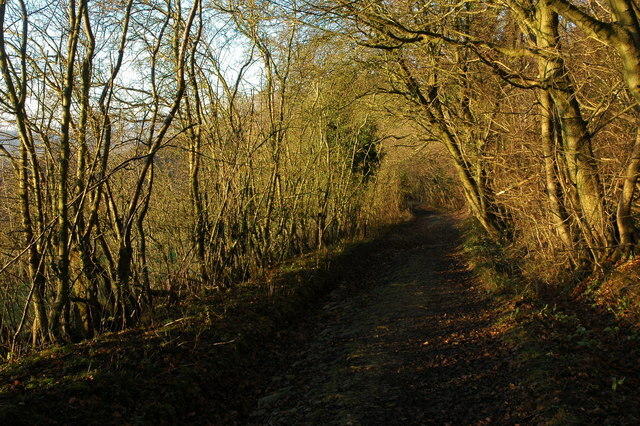 The Cotswold Way is my local path, or at least my local long-distance footpath. I’ve walked some bits of it many times and many bits of it some times. But I’ve never walked the whole length of it – just over 100 miles from Chipping Campden in the north to Bath in the south. That’s the challenge my daughter has taken on, to raise money for Raleigh International. So this week I set off to walk the first stretch with her. 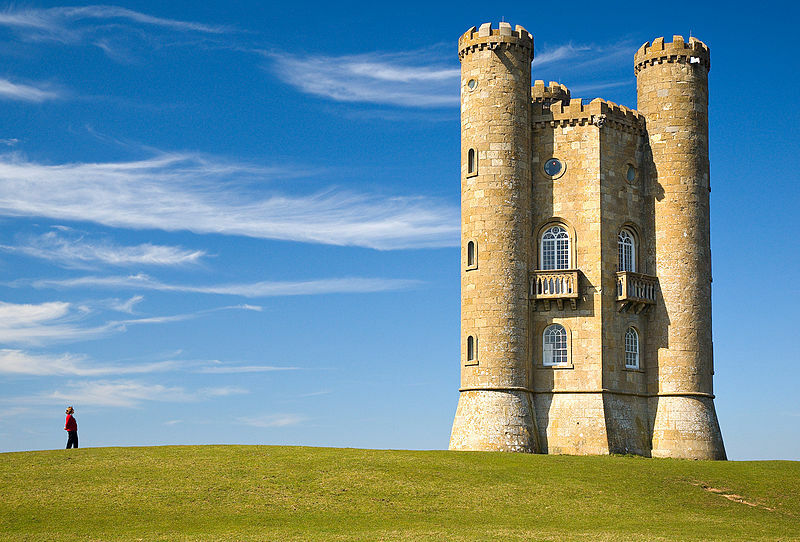 From Chipping Campden the path rises up to Dover Hill and along the Cotswold escarpment to Broadway Tower, before descending into Broadway. 5 miles down, and so far so good – a quick stop in one of Broadway’s many tea rooms and off back up the hill. A short walk along the top and again it’s not long before we’re back down in the valley at Stanton, described in two different guide books as being the ‘quintessential’ Cotswold village – a word that seems to have been invented just for Stanton. Across some distinctive ‘Ridge and Furrow’ fields to Stanway and Wood Stanway, and then we’re climbing again, steeply up the escarpment as it starts to rain, gently at first, and then more persistently. This is the low point of the day’s walk – legs are starting to tire, as the rain gets heavier and heavier, and we still have a lot of miles to go. 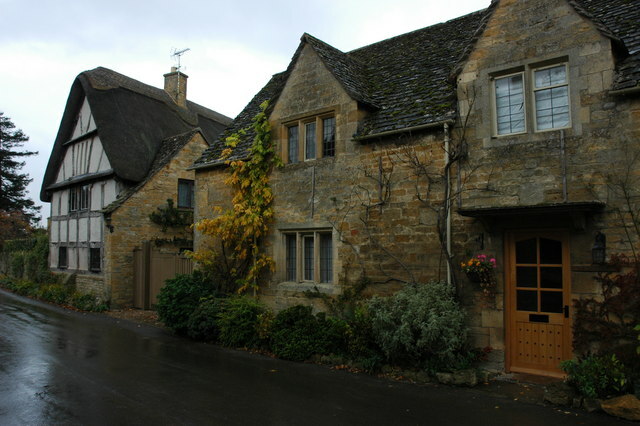 Stanton – the “quintessential” Cotswold village. Photo by Philip Halling. From the top of the hill at Stumps Cross, the path runs along past quarries before starting to descend again towards Hailes Abbey. The rain has eased off, but by now this pattern of continual climbing up the escarpment, then descending back down into the valley is starting to lose its interest – couldn’t they just design a path that follows the top of the escarpment? I suppose people from further away appreciate a route that takes in many of the towns and villages along the way, but as someone relatively familiar with the local area, it’s the bracing walks along the tops of hills, and the views that come with them, that are the attraction of the Cotswold Way. From Hailes the route cuts across fields to Winchcombe, before we start to climb again up to Belas Knap. That’s four times climbing up to the Cotswold escarpment in a single day, and by now we’ve done nearly 20 miles of almost continual up and down. It’s a long time since I’ve walked anything like as far as that in a single day, and I can certainly feel it in my legs. Alice is maybe not as exhausted as I am, but her feet are far worse, badly blistered and painful with every step. I’m just doing the one day, but her plan was to keep going for several days. She hobbles on for most of the next morning, but the blisters win and she has to take a temporary break. She’ll be back to do the rest of it, by which time I may have recovered enough to walk another stretch too. Lambay Island off the Irish coast is barely 15 miles from the centre of Dublin as the seagull flies, but it could be in another world. 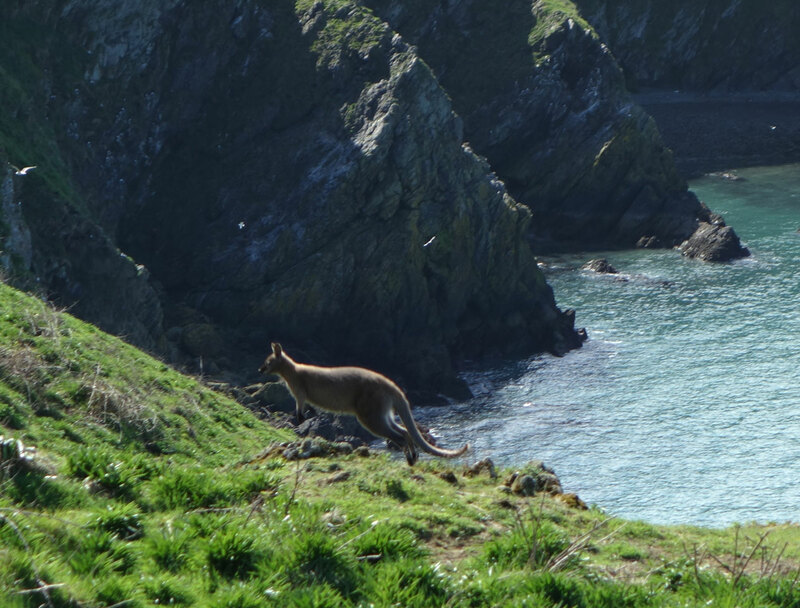 It’s home to tens of thousands of seabirds, a large number of seals, herds of deer and cattle, and most extraordinary of all, around 100 wallabies. Human beings though are mostly conspicuous by their absence, and the island is a wonderful haven for wildlife. 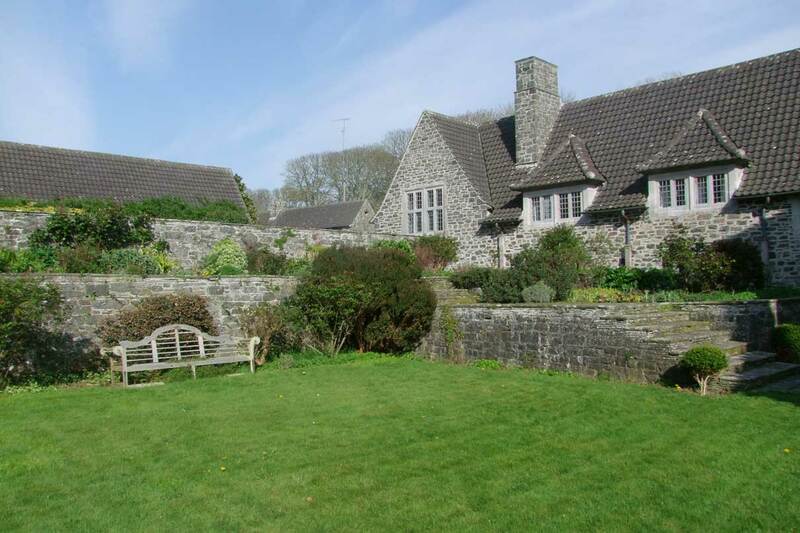 Despite this, the grandeur of the natural environment is almost matched by the grandeur of the built environment, with the main buildings having been designed by Edwin Lutyens, and the gardens by Gertrude Jekyll. 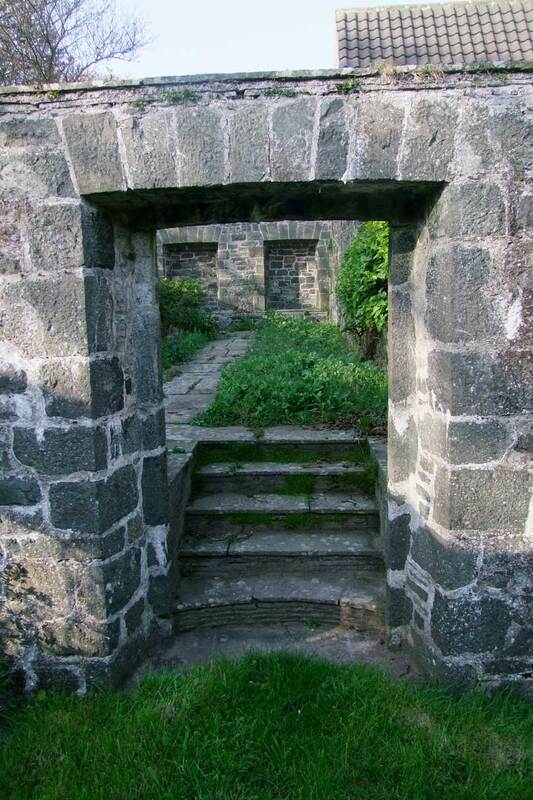 Even relatively humble farm buildings show the evidence of Lutyens’ characteristic style and the overall effect of the design is little short of magnificent. Lutyens’ involvement was commissioned by Cecil and Maude Baring, of the Barings banking family, who bought the island in 1904. It is still owned by a family trust set up by the Baring family. 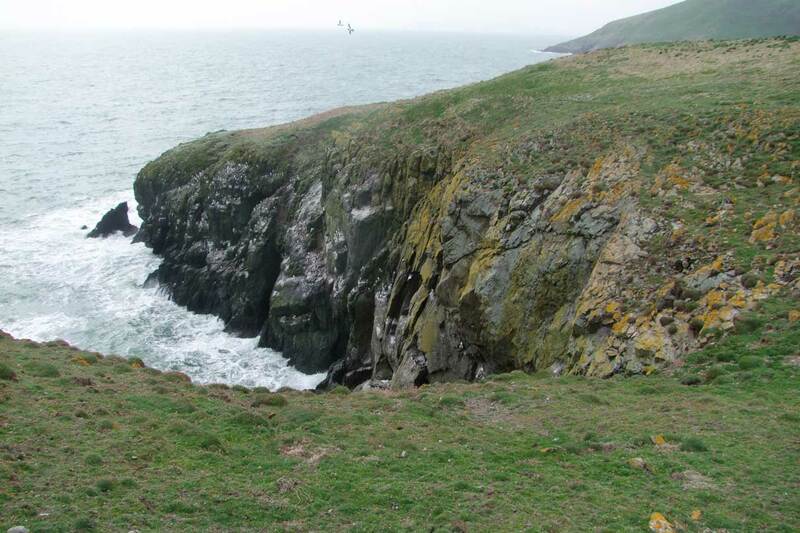 I had a rare opportunity to visit Lambay just before Easter, and it was quite an experience. Nothing quite prepares you for tramping across wild moorland and suddenly disturbing a wallaby, which springs out of the undergrowth and bounds away. Compared to that surprise, an unexpected connection to a largely forgotten author may seem trivial, but it was still another small delight of the visit. 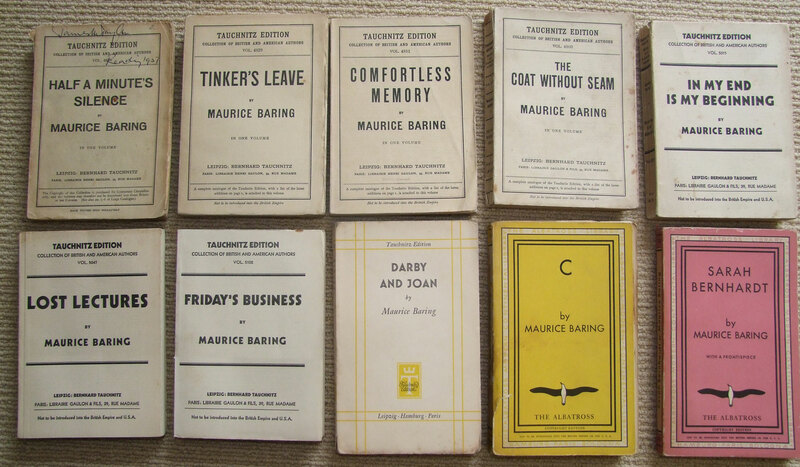 Maurice Baring was in his day a popular and prolific author, writing around 50 books including poetry, novels, letters, short stories and non-fiction of various types. 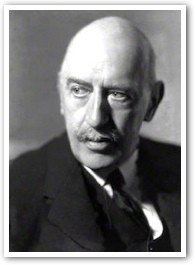 He was a friend of both G.K. Chesterton and Hilaire Belloc, and the three of them were often associated as Catholic writers, although he is nowadays less remembered than either of the other two. His privileged upbringing as part of the Baring family is reflected in his work and may even be part of the reason it has fallen out of fashion. Several of his novels and short stories were published in continental editions by Tauchnitz, starting in 1925 with ‘Half a minute’s silence’. His eighth Tauchnitz Edition – ‘Friday’s business’ – was published in 1933, but early in 1934 he seems, like many other authors (including Belloc), to have defected to Albatross. They published an earlier novel ‘C’ that Tauchnitz had apparently overlooked, and followed it up later in the year by publishing Baring’s biography of Sarah Bernhardt, who had been a personal friend. By then the effective takeover of Tauchnitz by Albatross was near, with the two series being run in parallel under joint editorial control from around 1935 onwards. There was to be one final publication by Baring – the novel ‘Darby and Joan’, and it appeared in the Tauchnitz series in 1936. 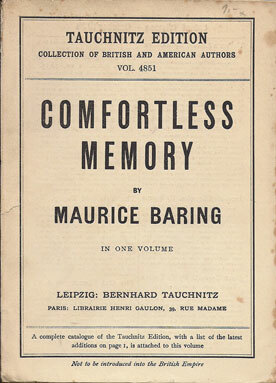 The basis for deciding which novels / authors appeared under which imprint has been much discussed, and it’s unclear why Baring may have been categorised as a Tauchnitz author rather than an Albatross one, but it may simply have been the comparison of eight previous works in Tauchnitz against two in Albatross. Maurice Baring was the younger brother of Cecil Baring of Lambay Island. I assume he must have visited the island, possibly many times – maybe he even disturbed a few wallabies. What’s the point of a publisher’s brand? I ask the question only because the answer would once have been obvious. The books that I collect from the 19th and 20th centuries are all clearly branded by publisher and the brand clearly adds value. Customers were more likely to buy the book because it carried that publisher’s brand. Penguin is probably the most familiar example for many people. Any book that appeared in the familiar Penguin designs automatically acquired some of the Penguin aura. The fact that it was a Penguin Book told the customer something about the book. The same is true of the Tauchnitz and Albatross books from Continental Europe. Is the same true nowadays, when branding has become such a sophisticated art? There are certainly all sorts of tags that tell you something about a book, and may make you more likely to buy it. The style of the cover is perhaps the most obvious, helping you easily to identify a thriller, or the latest ‘chick-lit’, or even to pick up clues about what other book it may most be like – ‘Fifty shades of grey’ being a recent example. Other clues may be the shape or size of the book, the quality of paper, even the font. But these tags have nothing to do with the publisher. If you’ve read ‘Fifty shades of grey’, do you know who published it? Are you any more likely to buy another book from the same publisher, because you enjoyed that one? If ‘Harry Potter’ is more your thing, have you tried another book by Bloomsbury? 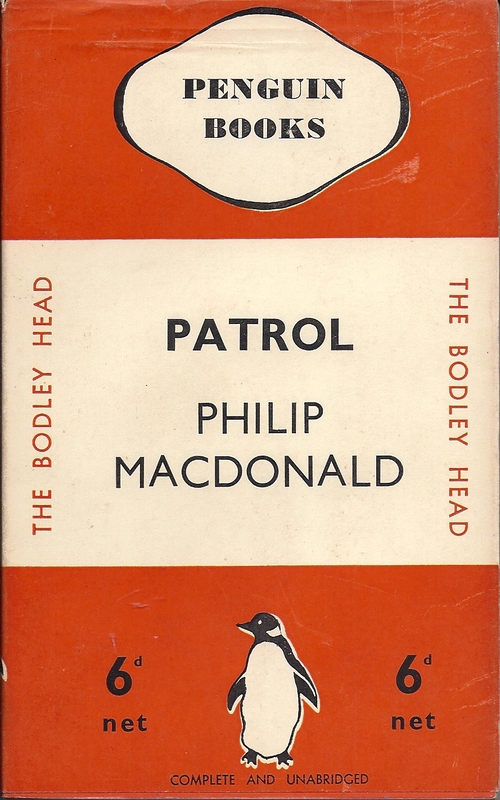 Lots of visual clues – but who’s the publisher? What of Penguin Books? They have survived and indeed prospered into the modern era, although now as part of a publishing empire that controls many different brands. I assume that Penguin Random House have some sophisticated strategy to determine how each of their brands is used. But what does the general customer now learn about a book from the fact that it is published by Penguin? 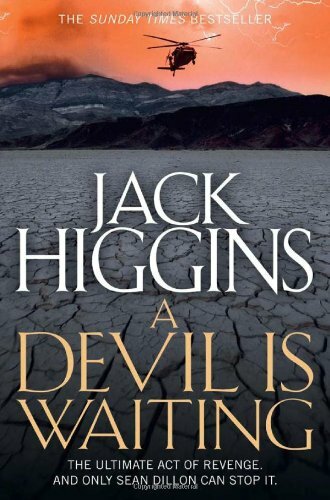 More generally would you ever buy a novel because of the publisher branding?